transportation and insurance sectors. Investors seek greater transparency and disclosure on the business risks of climate change as a means to protect and increase shareholder value. The key regulator that leads federal efforts to provide investors with information about corporaterisks and opportunities is the U.S. Securities and Exchange Commission (SEC). At the heart of the SEC's mission is the protection of investors through meaningful corporate reporting:The laws and rules that govern the securities industry in the United States derive from a simpleand straightforward concept: all investors, whether large institutions or private individuals,should have access to certain basic facts about an investment prior to buying it, and so longas they hold it. To achieve this, the SEC requires public companies to disclose meaningfu lfinancial and other information to the public. Only through the steady flow of timely,comprehensive, and accurate information can people make sound investment decisions. The SEC recognized the financial impacts of climate change when it issued Interpretive Guidance on climate disclosure in February 2010, responding to over 100 institutional investors representing $7 trillion who supported the Guidance. The Guidance outlines expectations from companies in reporting on "material" regulatory, physical, and indirect risks and opportunities related to climate change. 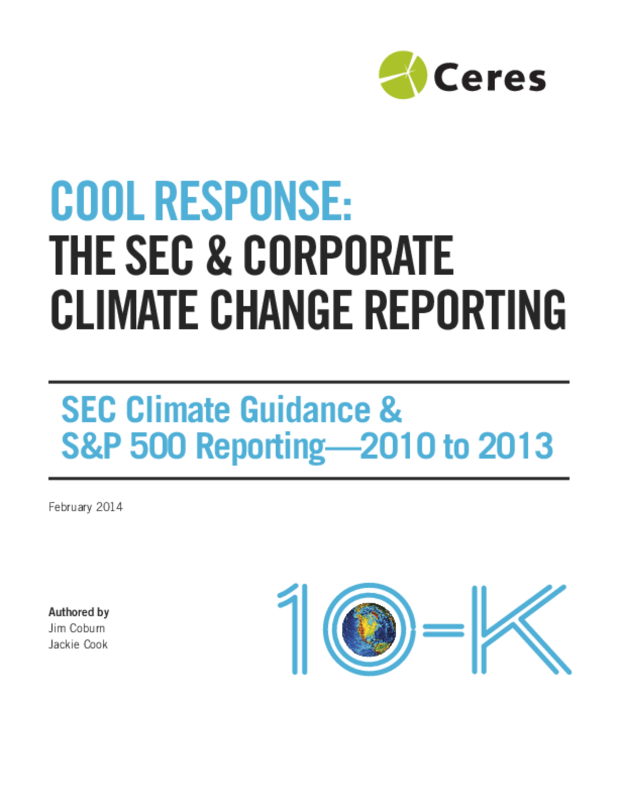 This report examines the state of such corporate reporting and associated SEC comment letters on climate change. It also provides recommendations for the SEC and companies on improving the quality of reporting. The report examines (1) the state of S&P 500 reporting onclimate disclosure and (2) SEC comment letters addressing climate disclosure from 2010 to the end of 2013.